The year was 1999, and at the Consumer Electronics Show, the talk was all about a newfangled device called the digital video recorder: the DVR. Two companies were fighting for dominance in the space, Replay TV and TiVo. Replay TV won “Best of Show” and Walt Mossberg, writing in The Wall Street Journal, crowned ReplayTV the winner over TiVo in a head-to-head review. Anthony Wood, Replay’s founder, was on a roll. He was the king of the world of time-shifted TV. He had seen the future, and built it. Then he took on the 800-pound gorillas of the video world, TV networks. It wasn’t pretty. In 2002, the main television networks and movie studios sued ReplayTV, claiming that skipping advertisements during replay violates copyright. The Electronic Frontier Foundation came out in support of ReplayTV, but alas — ReplayTV filed for bankruptcy. TiVo, while allowing users to skip commercials, didn’t provide a button to do it, and was able to survive. But Wood was sure TV was the future, and jumped back in, founding Roku in October 2002 with a crystal-clear vision. Television was about choice, and in a world of unlimited choices, consumers would need a single box to connect to all the services they wanted to access. Today Roku leads a market with heavy competition. Up against Google Chromecast, Apple TV, and Amazon’s Fire TV, Roku is leading the pack. And now Wood is growing the business in a way TV historians have noticed. As television becomes web video, and web video is by its nature more about granular services than big, one-size-fits-all networks, Wood’s vision may be coming true. Roku is selling 30% of publishers’ inventory on the Roku platform. Today there’s a new kind of TV ascending. It’s web video, and it’s what consumers have been clamoring for for the past 20 years. It runs on a time schedule that fits your life, with channels and services that are unique and narrow in their focus. And since that day on the CES floor back in 1999, Wood’s vision is coming true, and paying off. 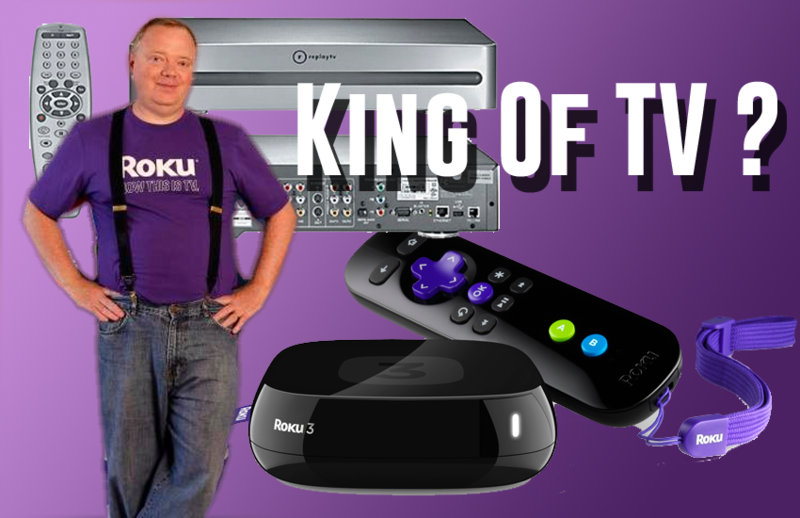 As of November 2017, Wood owns 27.3% of Roku, and with a market cap of $4.15 billion, that makes his net worth $1.13 billion, which is a remarkable result for the ultimate TV disrupter. If Wood has his way, cable TV will be a thing of the past. And the data says that’s just what’s happening. 2 comments about "The King Of TV?". Ed Papazian from Media Dynamics Inc, July 24, 2018 at 8:39 a.m. I recall a very widely read article in The New York Times, I beleive, claiming that commercial TV would never survive the onset of DVRs as everyone hated commercials and they would gleefully zap every ad. We all know how that turned out---don't we? The average percent of viewed TV content across all time periods that is delayed is about 10-15% and even though the commercial deletion rate for primetime network shows is fairly high, this is not the case for most of TV's content---despite the original doom and gloom predictions that made headlines twenty years ago. The takeaway is that primetime broadcast TV is only one component of an average adult's intake of TV content---and a fairly small one at that. It's a mistake to assume that this kind of fare---sitcoms, dramas, reality fare and newsmagazines ---represents all of TV. It doesn't. Tracey Scheppach from Matter More Media, July 24, 2018 at 11:29 a.m. I have never seen a story on the upside of the DVR. Think about it, Directv and Dish are using the DVR to enable a lot of addressable TV ad dollars...likely one of the reasons ATT bought Directv AND Time Warner (one day). Never really understood why TiVo did not pursue this strategy. Directv and Dish turned an ad industry lemon and turned it into lemonade and started to show us a smarter way forward.